Distance from the Liberty Stadium: 82 miles ~ 1 hour 40 minutes. Up to 4,200 away fans are one end of the stadium. The stand is close to the pitch with no supporting pillars so the view is good. The first refreshment kiosk inside the turnstiles gets really busy, so if you go up the stairs and through the double doors, there are a few more refreshment outlets where pies and pasties are sold also normally Fosters, Butcombe bitter, Guinness and Thatchers cider. Often a small beer bar and food unit is outside the visitors entrance. Bristol has plenty to offer, for nightlife there’s the city centre, in the Old City, on Harbourside and along Park Street and Whiteladies Road, or a more chilled out time in Clifton Village. Bristol has museums and art galleries aplenty, with the Brunel museum, Fleet Air Arm Museum and Kings Weston Roman Villa and others. There’s shopping north of the city at Cribbs Causeway and many shops in the city centre in Park Street, Clifton Village, Cabot Circus and The Mall. If you plan on making a weekend of it and celebrating the Chinese New Year, then there are plenty of hotels to choose from which suit all budgets. Other hotels are in the city centre with Premier Inn Bristol King Street (BS1 4ER), Premier Inn Bristol City Centre Finzels Reach (BS1 6BX), Premier Inn Bristol City Centre Lewins Mead (BS1 2PY) and the Premier Inn Bristol City Centre Haymarket, all of which are between 1 and 2 miles from Ashton Gate. The weekend of the game is Chinese New Year, so keep an eye open for festivities linked into this. Motown the Musical is at Bristol Hippodrome (BS1 4UZ) every night until the Saturday. Tickets are priced between £15 and £72. There’s a Haunted and Hidden Bristol Walking Tour on the Friday; the route of the tour takes in some of Bristol darker and creepier historical locations along with film and TV locations. It leaves Bristol Cathedral (BS1 5UY) at 8pm; cost is £5 (£4 students). Booking in advance is needed by calling 07766-258407. To mark the 500th anniversary of Leonardo da Vinci’s death, from the Saturday, Bristol Museum & Art Gallery (BS8 1RL) are displaying twelve of his finest drawings. Entry (to include other exhibitions) is £6, £5 for concessions and under 16s entry is free. The comedian Mark Watson is at Bristol Old Vic (BS1 4ED) on the Sunday, tickets are £20 (only returns are currently available). Clifton Suspension Bridge has a visitor centre (BS8 3PA) with free entry 10am-5pm. There’s exhibitions and information about how the bridge was built, how it operates and view a DVD about the bridge. There’s also a souvenir shop. Saturday morning The Ruff Guide to Shakespeare is at the Redgrave Theatre (BS8 3LE). There’s silly sketches, dance routines and extracts from the famous and some less well-known plays. Tickets are £8. Bristol Zoo (BS8 3HA) is always a good place to go. Save yourself some money by booking tickets online in advance. Prices are £10 for Adults, £5.50 for children and £9 concession. There are a number of food stalls around the stadium, mostly behind the home end. There’s also a KFC just outside the main entrance. Pubs near to the ground, the Hen & Chicken, The Robins and the Rising Sun are home fans only. There are many pubs in the city centre, near the waterfront are The Pumphouse (BS8 4PZ), and the Nova Scotia (BS1 6XL). Not far from the Nova Scotia is the Rose of Denmark (BS8 4QL) and popular with visiting fans, are all 1.1 miles away from Ashton Gate. As is The Cottage Inn (BS1 6XG) is on the river front and has real ale. The Tobacco Factory (BS3 1TF) is a 0.5 mile walk away and does food. Bedminster Cricket Club (BS3 2JX) welcomes away fans. It’s a 0.6 mile walk away, food is served and you can park for £10 per car. Near Temple Meads station is The Knights Templar (BS1 6DG), a Wetherspoons 2.7 miles away. The Orchard Inn (BS1 6XT) is a 0.6 mile walk from the ground. It has a number of ales, and up to 24 different ciders. Parking at the ground is for permit holders only and there’s hardly any street parking available. You can also choose from a selection of private car parking spaces near Ashton Gate – including around 114 reservable parking spaces from just £5.00 for the day. The nearest station is Parson Street, a 1.2 mile, 20 minute walk from Ashton Gate. Saturday afternoons for two hours before kick-off, trains are every 30 minutes from Temple Meads; it’s a 4 minute journey to Parson Street. Bristol Temple Meads station is 2.5 miles away; a taxi is about £8. 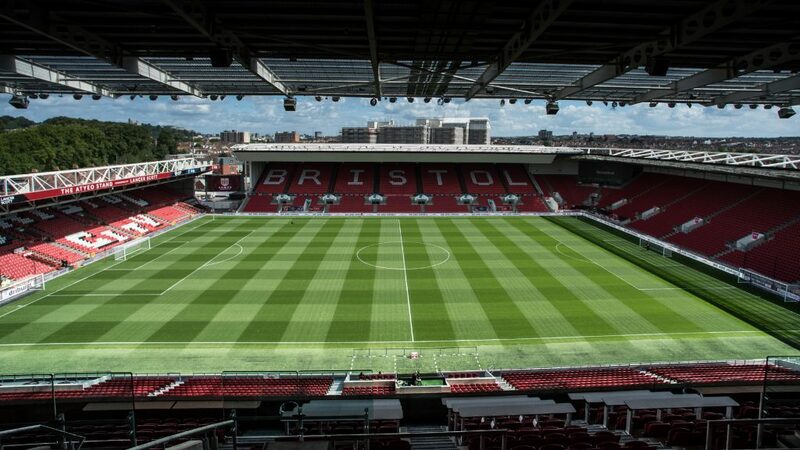 A shuttle bus service (£2 return) runs from near Temple Meads to Ashton Gate. It leaves one hour before kick-off and buses return after the final whistle. Pick up is across the main road at the bottom of the station approach road outside the exit to Temple Meads station and returns after the game from Winterstoke Road (the main road running past the ground with KFC/Wickes along it). The downside is that there are only three buses and they fill up very quickly. The 2 hour train journey to Parson Street leave at 09:29, 10:29, 11:29 and 12:00. Coming back, trains leave at 17:37, 18:35, 19:35 and 21:16, getting in at 19:43, 20:42 21:43 and 00:03. This Travelling Jacks guide was kindly provided by Swans fan Steve Griffiths.